I’m all upset over here! Okay, so I bought a watermelon to show you how fast I could cut it. 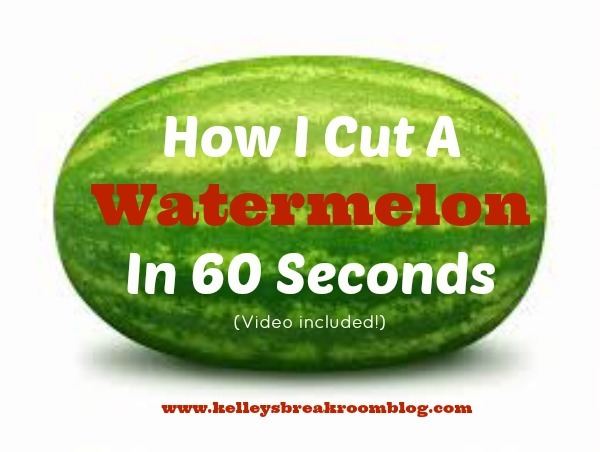 I brought up my amazing watermelon cutting skills (wink, wink) on the Kelley’s Break Room Facebook page last week. Some of you suggested that I actually YouTube it and so I did. Many of you said that you had a hard time cutting a watermelon. I thought it was only the right thing to do to show you how I make that watermelon obey me. But, LISTEN TO THIS, after I had already sliced the watermelon in half, my phone ran out of space! Dang it! I only had one watermelon to cut! I don’t make it a habit to buy more than one watermelon at a time! So, I had to start over with only 3/4ths of a watermelon to cut. So, that made me mad. I saw this dude on YouTube who cut his watermelon in 20 SECONDS! TWENTY STINKIN’ SECONDS! He was in a professional kitchen with a fancy trash can situated in his countertop. He wasn’t chatty like me and his photographer wasn’t a 5-year-old. That makes me want to go out and buy 50 watermelons until I can cut it in 20 seconds. I cut 3/4ths of my watermelon in a minute. I’m thinking I could cut the whole thing in 90 seconds or less but HE CUT HIS IN 20 SECONDS, MAN! Here’s my watermelon cutting show below. Please ignore the paint brushes I have on the counter behind me. I moved them over there thinking the other counter was going to be visible- the counter without all the paint brushes. I had a few trial runs, but you can understand why I was all flustered by the time I started recording again. By that time, I DIDN’T CARE ABOUT THE PAINT BRUSHES. And, yes, I feel stupid calling myself the “World’s Fastest Watermelon Cutter” when I am obviously am not. THAT GUY CUT HIS WATERMELON IN 20 SECONDS! Did I mention that already? What amazing skill are you going to put on YouTube and share with the rest of us? You know I’d love to see it! How about…making the bed really fast? Cutting a pineapple? Cleaning out the shower? Folding a fitted sheet? Record it, put it on YouTube, upload it to my Kelley’s Break Room Facebook page and SHOW US WHAT YOU GOT!